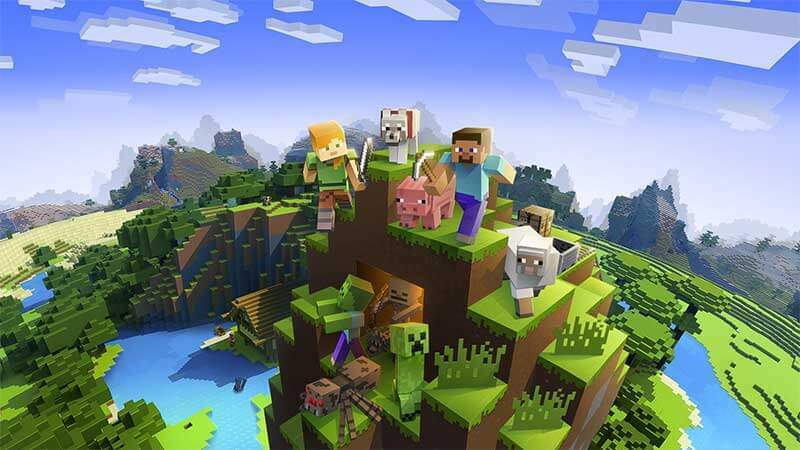 Since its release in 2009, Minecraft has been one of the most popular adventure games. In this game, you are in full control of the world as you gather materials and use them to craft tools and build yourself a shelter. If you’re looking for a quick guide to help you get started on Minecraft, keep reading to learn the basics of the game. When you first start up a game of Minecraft, you’ll be placed in a new world. In this world, there will be natural objects like trees, rocks and mountains. Your objective at this point is to begin harvesting materials so you can create tools and build yourself a shelter before the first nightfall arrives. However, you don’t actually have a tool to harvest with yet. Tip: You can use seeds to have a cool starting point in a new world. Seeds are strings of numbers and letters that can be used to get to one of these starting points. You can check out some of these cool Minecraft seeds here. Since you don’t have any tools yet, you’ll have to do your first bit of harvesting by hand. Fortunately for you, you can harvest wood from trees simply by punching them. To do this, use the left mouse button (RT or R2 on Xbox or PlayStation) to swing your furious fists at the trees. Once the tree block has broken, you can walk over the wood that’s sitting on the ground to pick it up. Since you’re just building a few simple things to get yourself started, you’ll only need 10 wood at the beginning of the game. One important thing to note is that the rules for harvesting change a bit when you’re playing in a multiplayer world. In multiplayer worlds, you can’t harvest anything within a 33×33 block radius of where you and the others spawned. Once you’ve got a little bit of wood to your name, it’s time to start thinking about finding shelter. This is one of the most important things to do before nightfall because shelter will protect you from skeletons, zombies and creepers during the night. If you don’t have suitable shelter, you’ll have to spend the entire night fighting off the horde of monsters. For most players, building a shelter somewhere high up on a mountain is the ideal situation. This will make it difficult for monsters who are on lower ground to get up to your shelter and find their way inside. However, as long as you build a solid shelter, you won’t have to worry about invading zombies and skeletons too much. However, you’ll need to convert your wood blocks into pieces of usable wood before you can begin building your shelter. Once you’ve figured out where you want to build your shelter, it’s time to build a crafting table. You can do this using wooden planks, but first you’ll need to convert them into a usable state. To do this, simply press “E” to open your inventory and use the 2×2 grid to the right of your character to craft. Planks are the simplest thing to craft in the whole game, so you shouldn’t have any trouble jumping right in and converting your blocks into planks. All you need to do is place your wood blocks in the 2×2 crafting grid to make planks. Each block you place in the crafting table will yield four planks. If you harvested at least 10 blocks at the beginning of the game, you should have a total of at least 40 planks to work with once you’ve converted all your wood blocks. Once you’ve got your planks created, you can build a crafting table so you can really start crafting. Now it’s time to build your crafting table. Keep in mind that you’ll be using this crafting table quite often throughout the game, so it’s important to put it in an easy-to-access location so you can quickly craft things in the future. Fortunately for you, building a crafting table is one of the simplest things you can do in the game—even if you’re a new player. A crafting table is built by arranging four planks into a square in the 2×2 crafting grid. Once you craft a table, you can choose where you want to place it. Now that you have your basic tools, you can build yourself a structure to protect yourself when the monsters arrive. The easiest way to build a shelter is to use your shovel to collect dirt to build walls. However, it’s important to note that these dirt walls aren’t incredibly durable. If you do want a sturdier structure to spend your first night in, you can always use your wood pickaxe to harvest stone if there’s some around you. As long as your structure covers all your sides, you’re safe to stay there until the morning. Once you’ve got your structure built, the next thing you want to do is get a furnace built in your house. To build a furnace, you’ll need to harvest 20 cobblestone. This cobblestone is often visible on the surface of the world, but you can always use your shovel to dig through some dirt and find more stone if you’re having trouble finding enough. As soon as you have 20 cobblestone, place it in your 3×3 crafting table leaving only the center square empty. This will create a furnace which you can place near your crafting table. Furnaces allow you to craft torches, which means you have a light source that allows you to explore the world at night. To start, you’ll need to craft some charcoal by placing wooden blocks above a wood plank in the furnace. You’ll want to repeat this process until you have five pieces. Armed with charcoal and sticks, it’s finally time to craft your torches. All you have to do is open your crafting table, place a piece of charcoal in the middle square, then place a stick beneath the piece of charcoal. Each stick and piece of charcoal will yield four torches. Place a few torches around your structure to make sure you have ample light at all times. Now that you’ve got some tools, a shelter, a crafting table, a furnace and some torches, you’re ready to get down to the truly fun part of the game: exploring. Take what you need and head out into the night to do whatever you please. You can collect materials or work the land to create another stunning structure, or you can begin working on getting a new set of stone tools. You can even dig beneath your structure to see what lies deep below the ground. Whatever you do, have fun and watch out for the monsters that may be lurking in the night.